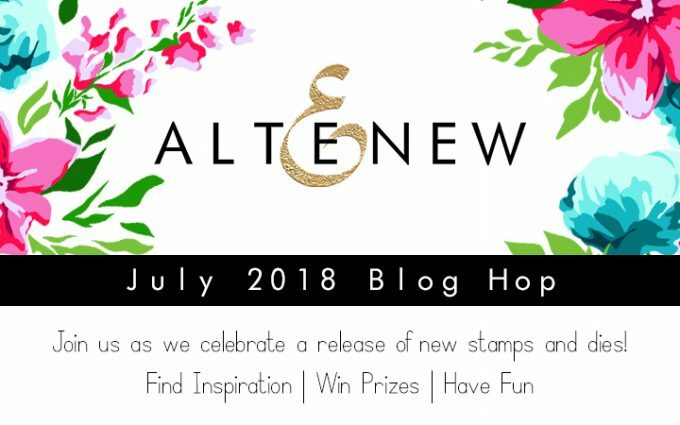 Hello and welcome to Altenew July 2018 Stamp/Die Release Blog Hop. We are celebrating the release of new amazing stamps and dies! 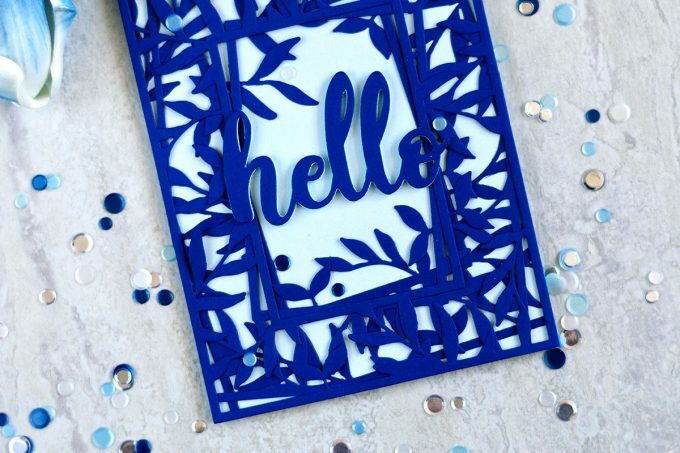 The new Leaf Frame Die is very beautiful and a “staple” kind. It can be used in many different ways. I’m currently in a “leaf layering move” so I layered three die-cuts of this frame one onto another. So I die-cut three floral frames out of a dark blue cardstock and adhered them onto another wit a small rotation. Then I trimmed the two underneath frames edges which where popping out of the top frame. I also die-cut one more frame out of the same cardstock and cut out some branches from it, which then adhered under my layered piece (those this are in the frame opening in the middle). 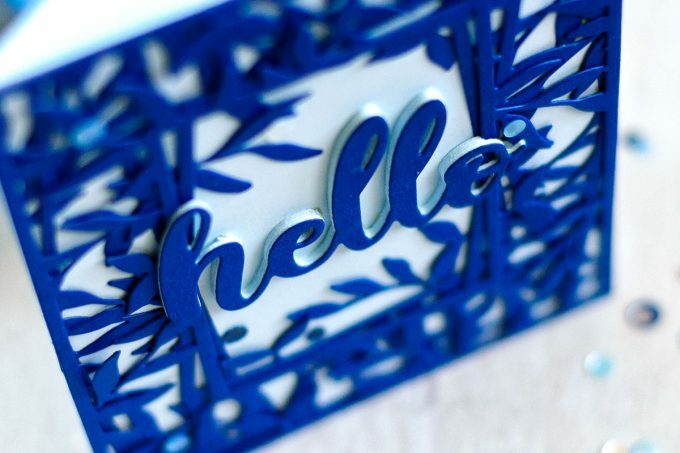 For the sentiment I used the new Simply Hello Die making a DYI chipboard with it. Light blue die-cuts were used for the dimensional part and the same dark blue for the top layer. I cut out the side pieces (from letters H and O) of the two light blue die cuts to make the sentiment fit into the frame opening and be positioned even. Lastly I added several blue confetti. For the next card I used the new amazing Floral Alphabet Stamp Set and the set of coordinating dies. I made a rainbow watercolor background onto a watercolor panel.. Or maybe I should rather say – a rainbow Galaxy background lol. The original idea was to make a colorful backgound. Once I finished it I felt something was missing and decided to add some white spray splatter. Went a bit overboard by spraying literally the whole background which made it look like a Galaxy one. Then I white embossed the sentiment onto the panel and then cut out using the matching dies to make the letters dimensional. Which I did by die-cutting the same letters out of white cardstock several times and adhering together. I adhered the panel onto a white card base and inserted the letters into their negative spaces. For my next card I used new Round Maze Die. This card is very simple looking, but it’s my favorite from the release. This card was inspired by Maze Runner movie (yes I watch a lot of movies lol). First of all I wanted to replicate this overgrown stone maze look. Which I did using a colored with Forest Glades Ink Spray embossing paste. I die-cut the maze out of green cardstock, temporary adhered it to my glass mat an spread unevenly the paste using a palette knife. And I did the same for the M, A, Z, E letters, die-cut using Fine Alphabet Die Set. All that were adhered onto a Parchment card base. I finished off the card by adhering a white embossed on a vellum stripe sentiment. From time to time to be sure that there will be the end of the world I have to make a card with dark background 🙂 My next one is one of those. I used beautiful Live Is Awesome Set for this card. The card is very basic. 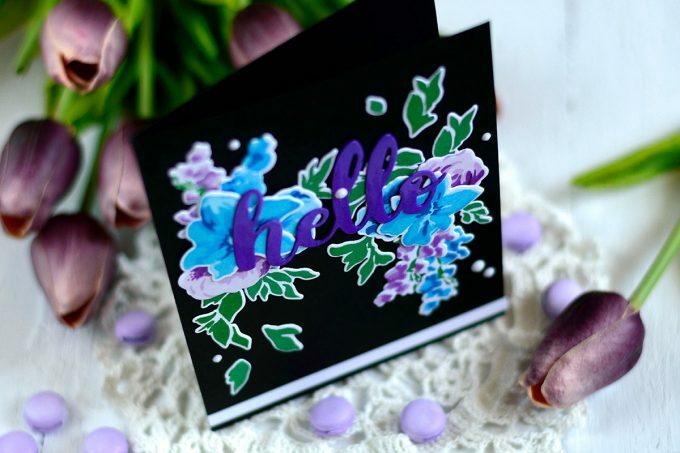 I stamped and die-cut many flowers and leaves using blue and purple inks for flowers and greens for leaves. And adhered them onto a black card base. 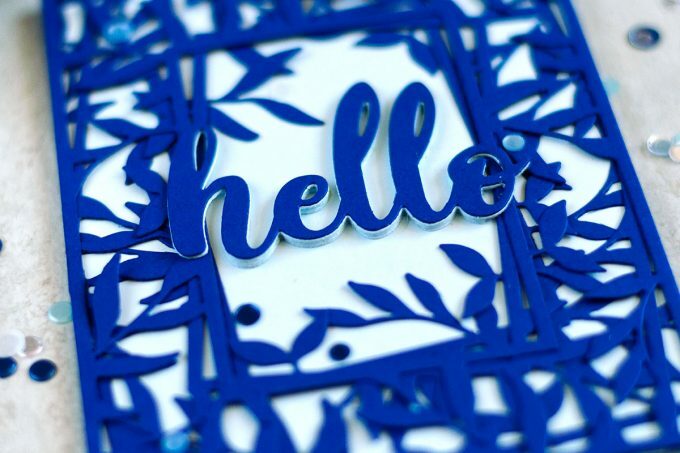 Followed by adhering a Simply Hello die-cut on top. Cut out of a white cardstock and then colored with Artist Markers. I added a white stripe in the bottom part for some additional interest and to balance out a card by introducing the same color as those white die-cut borders. Lastly I added several Snow Crystlas. My last card for today is made using new Beautiful Heart. I wanted to make one bright flower in the middle of a lot of leaves. And initially I planned to stamp all those leave onto a white cardstock. With hours of masking, ink blending. But then I remembered that there are colored cardstock existed in the world. And not only in the world – in my craft room too, takes quite a bit of space (not speaking of the money spent on it). So I stamped several leaved directly onto the green card base and I love the result! Also the leaves in this set are so realistic, beautiful and simply very cool. I also blended some pink and green ink onto a white cardstock, then stamped flower and leaves onto it and cut out using matching dies. All that was adhered onto the card base. I popped up the sentiment white embossed on two black stripes and accentuated the card with several Onyx Crystals. 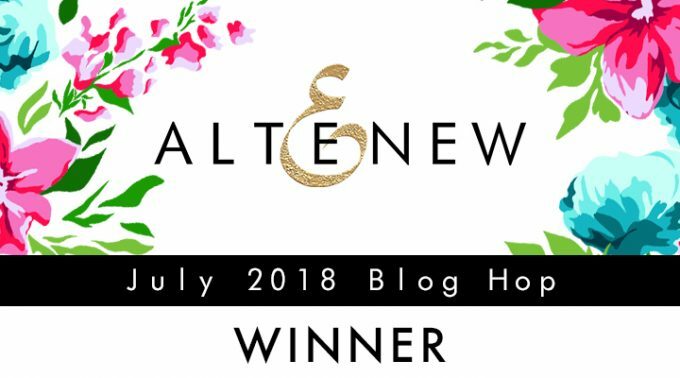 I will also randomly choose a winner from comments left on this post and the prize will be $30 gift certificate to Altenew online store. Please leave a comment on this post by Tuesday, July 24th at 11:59 PM EST for a chance to win. I will announce the winner here in this post on Wednesday , July 25th. The winner of $30 Gift Certificate is Michele K. Henderson. I will be e-mailing you instuctions of how to claim your prize. The next stop in the blog hop will be Lilith Eeckels. If you got lost, please go back to Altenew Card Blog. 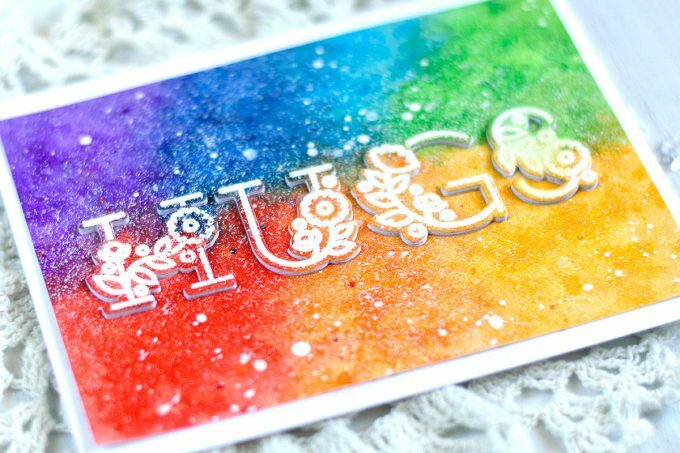 I love your colorful galaxy hugs card 🙂 I adore the new floral alphabet set! You just keep making those dark cards, and I’ll keep loving them! Your MAZE has absolutely captured my heart today, however… I’m already trying to incorporate that brilliant idea with another mossy beauty I’ve recently seen on IG! Wow… all of your cards today are unique and beautiful. I love the way you layered three floral frame dies for the one card… Really detailed. And the Beautiful Heart card… my fave! Wow! LOVE that rainbow galaxy background. Stunning cards! Svitlana your designs are fantastic, love the many ways you have used the new products, especially the frame and Beautiful Heart set. Thanks for the inspiration! Wow!! I am loving all your brightly colored cards!! I L*O*V*E the dark cards! Adore how the bright, happy colors just pop, pop, pop! favorite techniques. And those floral alphabet? Mt favorite of this release! Great cards Svitlana. Wonderful colours & so full of life. My favourite stamp set in this release is the Needlework Motif. Anything with the beautiful Jacobean pattern grabs my attention. Nice colorful (galaxy) background!! Beautiful cards and stamps! So beautiful! Thank you for the great tips!! Wow, these cards are all so gorgeous! 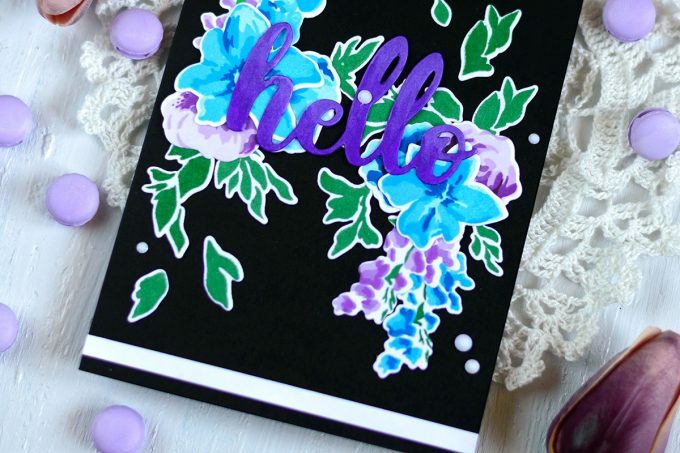 My favorite is the Life is Awesome flowers on the dark cardstock, simply stunning! Soo pretty! I love how you layered the Leaf Frame and the Floral Alphabet stamps look so pretty and delicate on white vellum!! SO many great ideas, TFS!! Beautiful cards…love your choice of colours! Gorgeous cards! 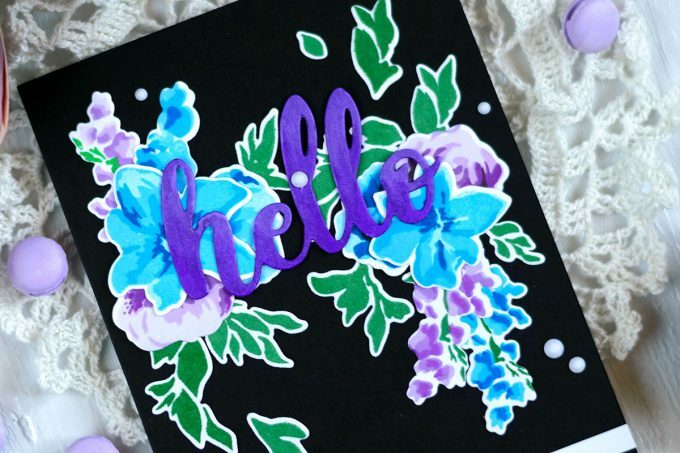 I love the multicolor background with the floral alphabet wording, so very pretty. Your cards are so beautiful! Love the last one the best!! Beautiful cards I really like your inspiration from The Maze Runner with this unique and big die! Oh Svitlana, what gorgeous cards. I especially like the Leaf frame and the floral alpha cards. You have been one busy lady! Such amazing cards! What a fun new release! Wow, stunning and wonderfully creative cards! Bold, vibrant and just plain fabulous. Your cards are beautiful. Love your use of color. Beautiful cards, my favourite is the Life is Awesome. Thank you for sharing your beautiful designs. Love that Beautiful Heart stamp and die set. Thanks for the inspiration! You done it again. Every card is stunning and beautiful. I like the variety of styles that you created. Your cards are stunning ! 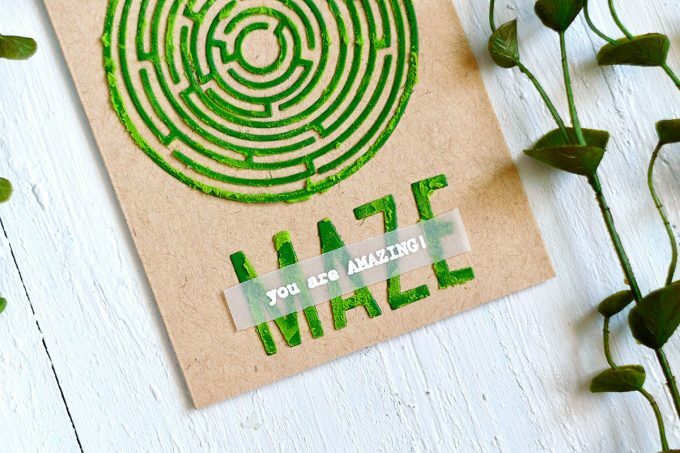 The colors are fantastic and the texture of your maze is….. amazing (yes, I know, that was an easy one ! LOL !) I really had to look twice to see how it was done. 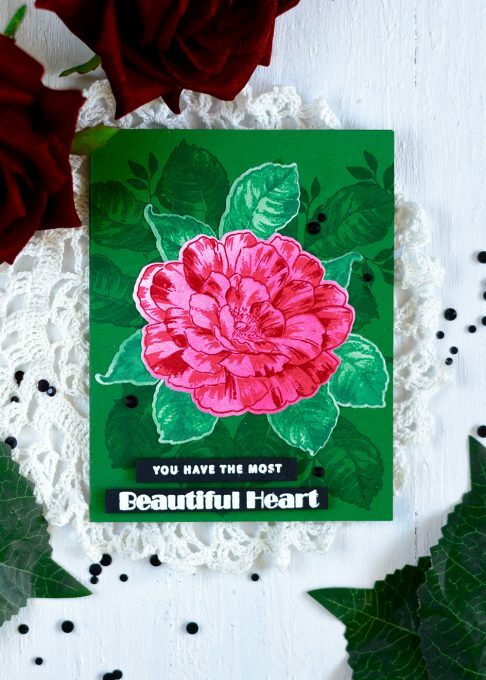 The dark green background you made for the Beautiful Heart flower is such a gorgeous back drop for your beautiful red flower! Love the other cards, but this one just stands out and is the winner in my book. 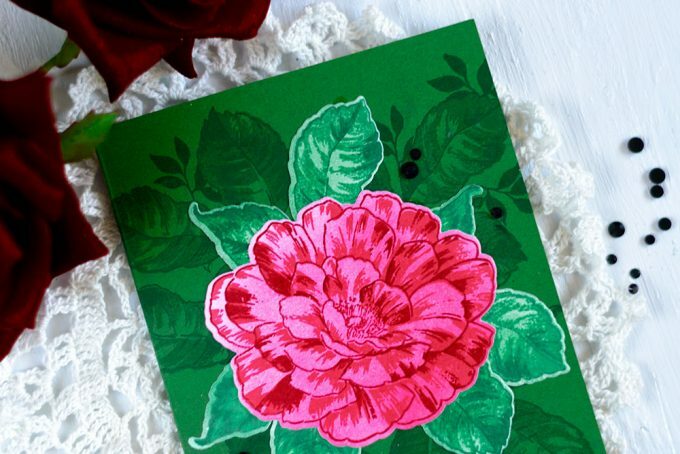 Your cards are all so beautiful – love the floral letters. 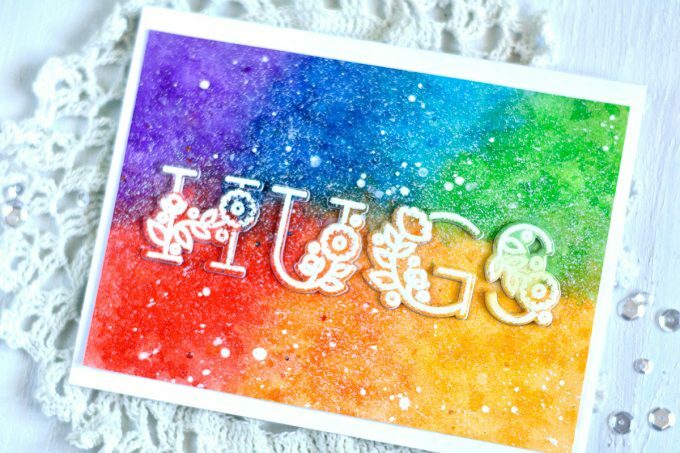 I absolutely LOVE your HUGS card! I have a thing for rainbows! 🙂 They just make me happy plus you don’t have to choose — you can have ALL the colors! 🙂 Beautiful job on them all! Love the rainbow galaxy, and the rose is stunning against the green background. I love the floral alphabet! Thanks for the great inspiration. What a great release. These are all lovely, but I’m really partial to the blue and white floral frame & hello card. 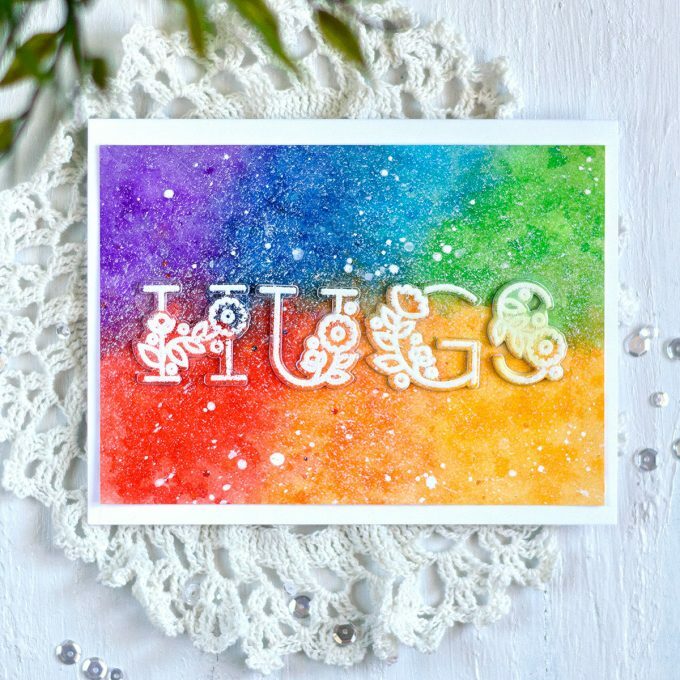 Love all of your cards, but especially the Hugs Card – stunning! Beautiful cards! Love the creativity with the various new releases! My favorite is definitely the black card with the Life is Awesome stamp set. The contrast is great! Beautiful cards. Love the bright blue & the rainbow background. Thanks! Oh how I love the Beautiful Flower set. You made it very lovely and I need to order it now. Beautiful cards! I love the first one and how you offset the floral frames – that looks so great! Thanks for the inspiration today! Such colorful and amazing cards! Of course the new release gets all the credit – wonderful! another great release and such beautiful ideas. thanks as always for sharing. Fabulous cards. Love the beautiful flowers on the dark background. Your HELLO card is SOOOO AWESOME! Love the bright colors used on the florals. Love them all! That beautiful heart card is magnificent! Also reallylike your background on the HUGS card. Your rainbow galaxy is awesome! All of your cards are beautiful! Such fabulous cards as always! I love the maze and hugs cards! All your cards are gorgeous!!! I love the new releases!! My favorite of your catds is the beautiful heart! Those colors you used are wonderful & so vibrant!! Thanks so much for all the inspiration!!! Beautiful Heart is fast becoming one of my all time favourite stamp sets! I love your card samples. Fabulous release! The black card is awesome! I like all of the cards you created. 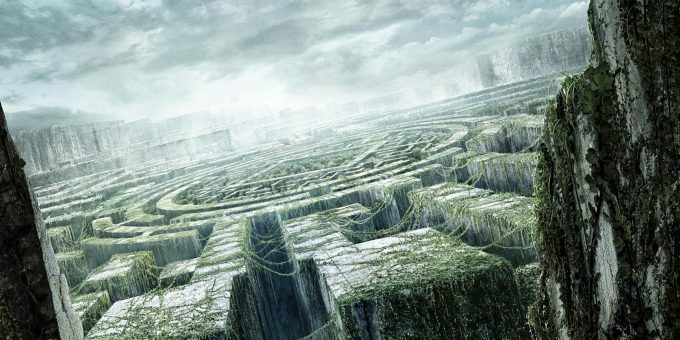 The MAZE is my fav as well. Your cards are wonderful. Thank you for sharing them. I love ALL of your cards, but the MAZE is my absolute favorite from the new release too! I love what you’ve done with it – awesome! Thanks for some fun inspiration today! The green on green background of the heartfelt beauty set really makes the card standout, love the simple yet elegant technique. Wow! Your cards are so uniquely made! 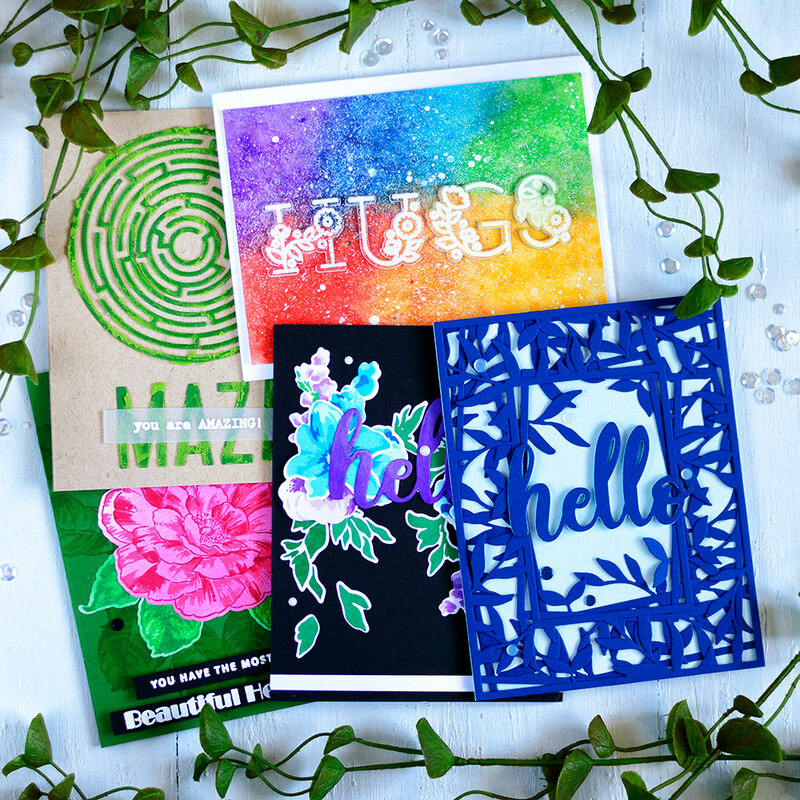 The maze card is too cool and the floral alphabet card is gorgeous! You did a great job with this new Altenew release! Fabulous cards. My fave is the rainbow Hugs card. Your bright colors bring a modern touch to all these cards. Lovely. Life Is Awesome Stamp Set is wonderful. I love seeing the bright colors you choose in your card art. Your designs are so striking and they just make these fun Altenew products come to life! BEAUTIFUL! I love the hello leaf frame card! You are talented! Love me some pretty inspiration. Svitlana, you are amazing-pun intended! Wow, that maze card with the green floral grass type accent; so super cool. You did a great job copying your inspiration! 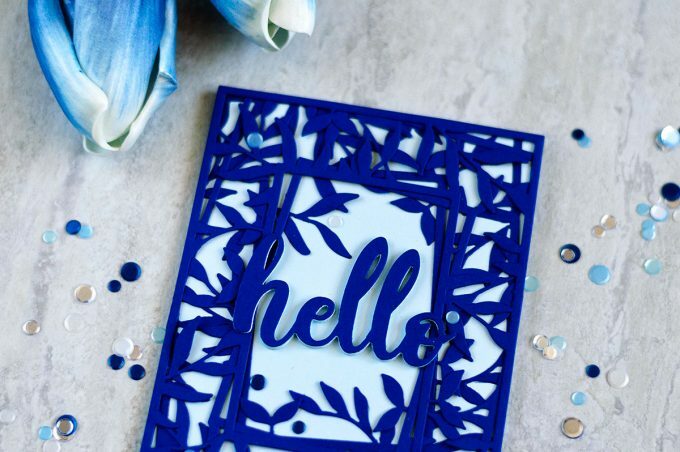 I also really like your two Hello cards with the blue leaf frame die and the wonderful blue flowers that you used on the other. Your talent is truly amazing! Thank you for sharing! Such a fantastic variety of cards! I love your unique approach to card making. The maze card is like nothing I’ve seen before. It looks incredible! Thanks for sharing it! As always your cards are just beautiful. I do love the effect of layering the leaf frame die. Loving the variety in your cards! 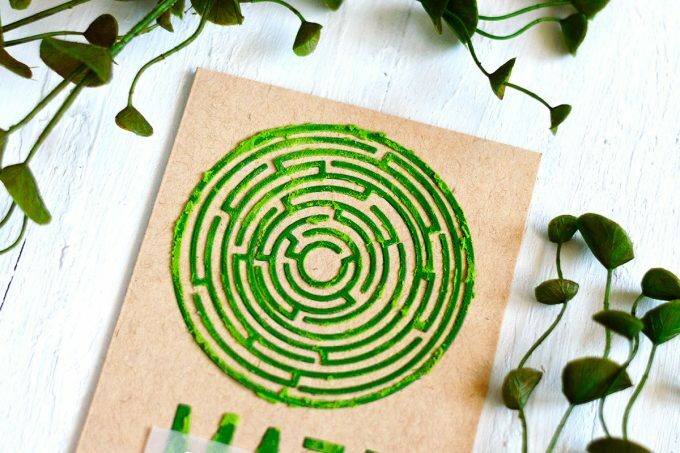 My favorite is the maze too, I love that green texture, reminds me of those hedge mazes from the top, very cool looking! Each of your cards is lovely, but I was so intrigued by the technique you used to complete your aMAZEing card. I have to try it! Thank you for the oh so cool technique to try! Oh your cards are gorgeous! So colorful and unique. Love them all. Thanks so much! Beautiful cards! I especially liked the hugs one. Great Release! Wonderful creations! I especially love the Layered Leaf frame coverplate card! 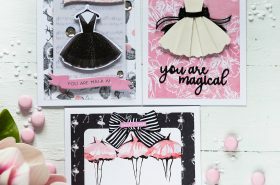 Great release and I love the gorgeous inspiration cards! Your cards are always so vibrant and colorful – really enjoy your creations! Wow! These are all gorgeouse! Love the purple and blue flowers on th black! You have an amazing gift for creativity. I am just in awe of the Maze card! AMAZING!! 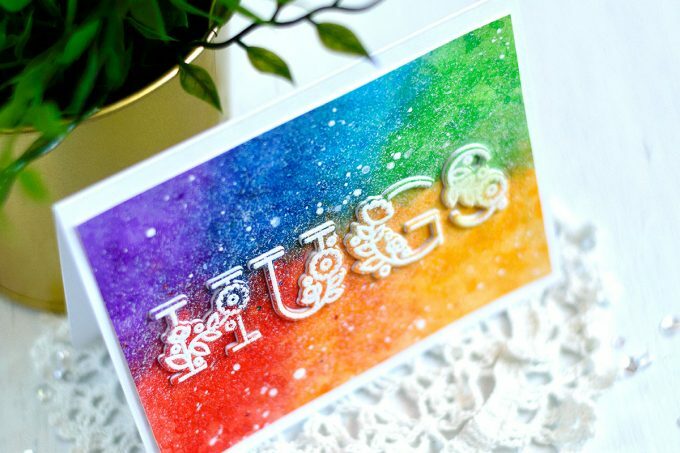 Lve the rainbow galaxy card! Beautiful projects. I think my favorite is the Beautiful Heart card, but I so love the unique way you used the Leaf Frame die. All are gorgeous. All these cards are so pretty love them all but hugs in floral alphabetic is an extra amazing . What great cards! I love your colors. all such beautiful cards, Svitlana – such a wonderful release!! so many beautiful cards, so many amazing new products! I love the blues against the black background with your Life is Awesome card! Great cards! I LOVE that maze die! It looks like a prayer labyrinth! Your cards are all stunning but of course seeing that one in the gorgeous green really caught my eye! As always, your cards are stunning. I love the rainbow background and love the beautiful heart card. Your cards are very beautiful!! These cards are so bright and vibrant!! Love the beautiful heart stamp can’t wait to get it. Love all your cards. All of your cards are beautiful (except the MAZE it’s a bit spooky LOL). I really love the black background with the vibrant colors of the florals, that one is stunning! Such wonderful creativity and today’s post is all about bold color! I especially appreciate the leafy background-it turned out beautifully. Such a fun idea. Thank you. Love your cards, but I think my fav is the floral hugs card. The colorful galaxy background is beautiful. Amazing how things just happen. Your cards are very unique and beautiful. I really like the “dark” backgrounds. Makes those colors pop! 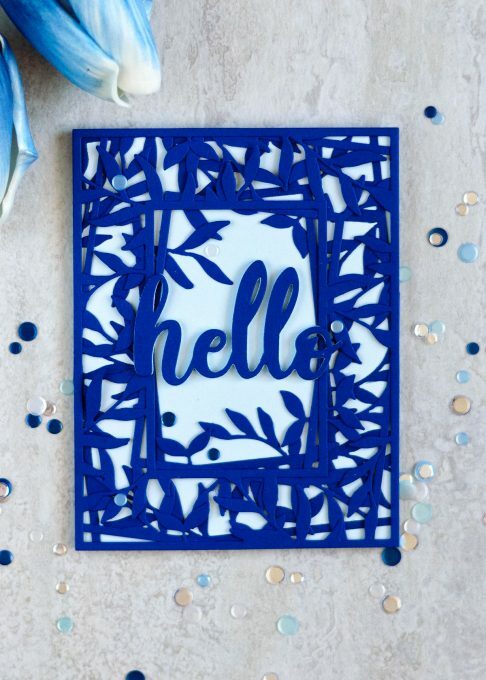 Wow, I love the layered leaf frame, the blue with white background makes it POP! I love how the color you used was called forest glades, even the color seems like a Maze Runner inspiration. Lol. 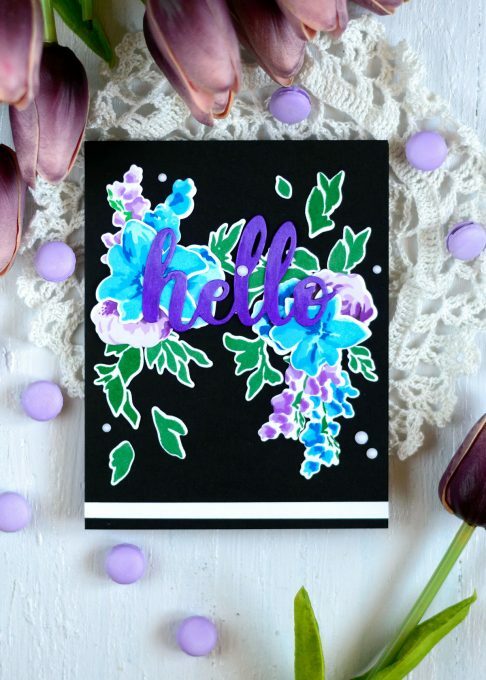 I totally love your floral hello card with the black background. It’s gorgeous!!!! Lovely cards.. 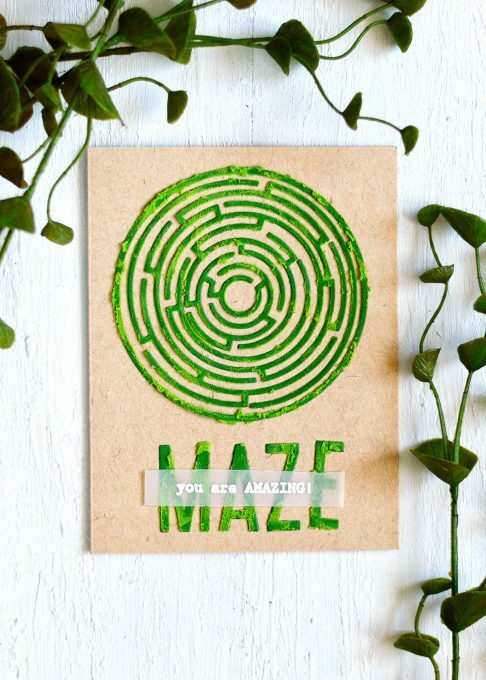 I love your Maze inspiration card! Lovely. My favorite (while there are many) are the floral alphabet and coordinating dies.. How fun! luv the fun element of your overgrown maze! Such beautiful cards and especially love the Maze! Thanks you for the instructions on how you did it!! Loved your inspiration and creation! So beautiful! Such beautiful creations! 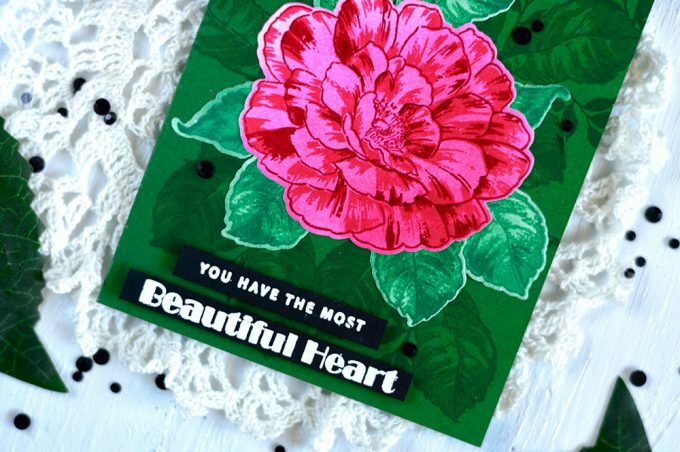 Your Beautiful Heart card is amazing! Love the watercolor look on the Life is Awesome card! LOVE the new releases and your variety of designs and techniques! Your projects are always beautiful and inspiring. I really love how you layered all of the leaf frames together without making the project look cluttered. Thanks for sharing. Thank you for all the beautiful inspiration. I really enjoy watching you create. Stunning, your choice of colors. I love the vibrant colors you choose! Fantastic cards! 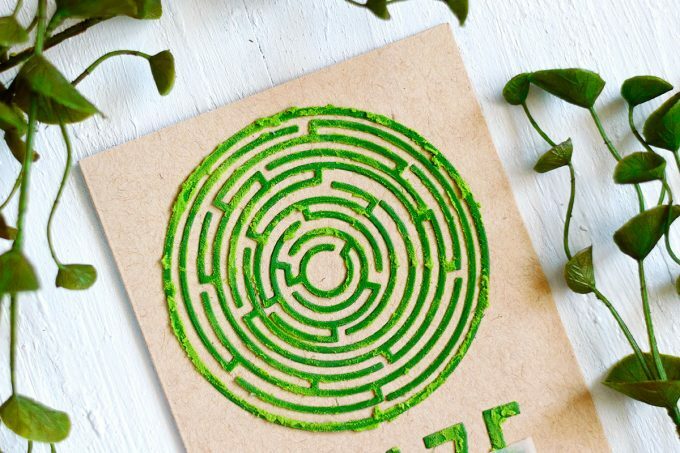 Really like the look/texture you achieved with the embossing paste on the maze card. Clever. Thanks for the inspiration! All your cards are gorgeous! My favorite is the rainbow galaxy!! Thanks for the inspiration you always make wonderful creations! Wow! I love the hugs card! Very nice!! I always loved your dark backgrounds. Gorgeous cards and beautiful release. Какие красивые и разные открыточки!!! Опять моя любимая (в твоем исполнении) на темном фоне. А еще очень понравилась с цветком на зеленом – очень шикарно!!! И отдельное спасибо за сладость! Your vivid colors inspire me. 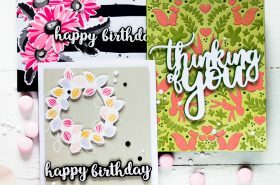 Beautiful cards and spectacular ideas for using products from this new release. Thanks for sharing!